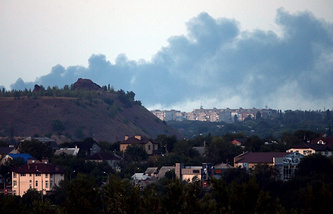 DONETSK, September 01. /ITAR-TASS/. Militias of southeast Ukraine’s Novorossiya army have killed or wounded 100 pro-Kiev troops and shot down one Su-25 attack aircraft and two Mi-8 helicopters on the approaches to Mariupol, the militia headquarters said on Monday. The Novorossiya fighters have also seized two tanks, about six multiple launch rocket systems, two armored personnel carriers, up to 14 artillery guns and mortars, up to 24 vehicles and two depots with ammunition, the militia headquarters reported. The Novorossiya fighters also successfully fought against the Ukrainian troops on the Sea of Azov, their first sea battle, destroying two border guard boats, which tried to shell the militias in the village of Shirokino near the town of Novoazovsk, the militia headquarters said. ITAR-TASS has no confirmation of these reports from other sources so far. “The Ukrainian military surrendered arms in the area of Starobeshevo (in the southeast of the Donetsk region). The prisoners of war have been sent to detention facilities. Medical aid has been provided to the wounded,” the DPR headquarters was quoted by the Novorossiya news agency. “The first column of surrendering servicemen came under friendly fire while the second passed unhindered,” eyewitnesses said. According to preliminary information, this group of Ukrainian troops accepted DPR premier Aleksander Sakharchenko’s proposal made on Saturday to surrender arms. 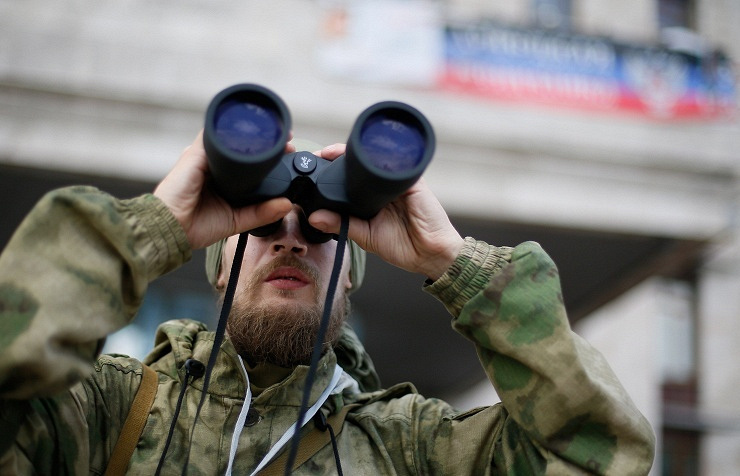 The sides have been actively firing on each other’s positions, the Novorossiya news agency said. Several Ukrainian army groupings are encircled by the militia fighters in three locations, it added. The DPR militias continue an offensive in the south of the Sea of Azov. After gaining control of Novoazovsk, the militias have so far avoided storming Mariupol, only sending sabotage and reconnaissance forces bypassing the city, blocking the road to Berdyansk, the agency said. 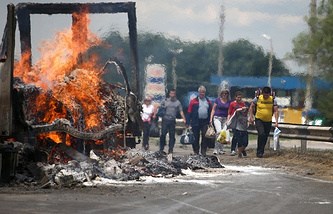 After week-long fighting, the militias have forced the Ukrainian troops back from the Novosvetlovka settlement in the Luhansk region that opens the way to the cargo delivery to Luhansk, a military analyst told Novorossiya.